This article is about literary enthusiast group. For other uses, see Inkling (disambiguation). 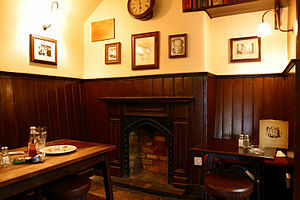 A corner of The Eagle and Child pub, formerly the landlord's sitting-room where the Inklings met. There is a small display of memorabilia. "Properly speaking," wrote Warren Lewis, "the Inklings was neither a club nor a literary society, though it partook of the nature of both. There were no rules, officers, agendas, or formal elections." As was typical for university literary groups in their time and place, the Inklings were all male. Readings and discussions of the members' unfinished works were the principal purposes of meetings. Tolkien's The Lord of the Rings, Lewis's Out of the Silent Planet, and Williams's All Hallows' Eve were among the novels first read to the Inklings. Tolkien's fictional Notion Club (see "Sauron Defeated") was based on the Inklings. Meetings were not all serious; the Inklings amused themselves by having competitions to see who could read the notoriously bad prose of Amanda McKittrick Ros for the longest without laughing. The name was associated originally with a society of Oxford University's University College, initiated by the then undergraduate Edward Tangye Lean circa 1931, for the purpose of reading aloud unfinished compositions. The society consisted of students and dons, among them Tolkien and Lewis. When Lean left Oxford during 1933, the society ended, and Tolkien and Lewis transferred its name to their group at Magdalen College. On the association between the two 'Inklings' societies, Tolkien later said "although our habit was to read aloud compositions of various kinds (and lengths! ), this association and its habit would in fact have come into being at that time, whether the original short-lived club had ever existed or not." Until late 1949, Inklings readings and discussions usually occurred during Thursday evenings in C. S. Lewis's college rooms at Magdalen College. 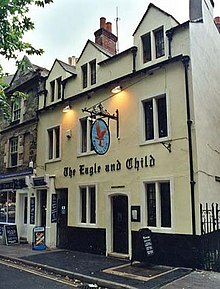 The Inklings and friends were also known to informally gather on Tuesdays at midday at a local public house, The Eagle and Child, familiarly and alliteratively known in the Oxford community as The Bird and Baby, or simply The Bird. Later pub meetings were at The Lamb and Flag across the street, and in earlier years the Inklings also met irregularly in yet other pubs, but The Eagle and Child is the best known. The Marion E. Wade Center, located at Wheaton College, Illinois is devoted to the work of seven British authors including four Inklings and Dorothy L. Sayers. Overall, the Wade Center has more than 11,000 volumes including first editions and critical works. Other holdings on the seven foremost authors (G. K. Chesterton, George MacDonald, and Inklings Owen Barfield, C. S. Lewis, J. R. R. Tolkien, and Charles Williams) include letters, manuscripts, audio and video tapes, artwork, dissertations, periodicals, photographs, and related materials. Wheaton also has a creative writing critique group inspired by the Inklings called "WhInklings". The Mythopoeic Society is a literary organization devoted to the study of mythopoeic literature, particularly the works of J. R. R. Tolkien, C. S. Lewis, and Charles Williams, founded in 1967 and incorporated as a non-profit organization in 1971. A resurrection of the Inklings in Oxford was made in 2006; the group still meets every Sunday evening, currently at St Cross College nearby the Eagle and Child. It has similar aims and methods to the original group, albeit with somewhat gentler criticism. The undergraduate literary and art magazine at Miami University in Oxford, OH, is named Inklings. They also meet on Thursday nights. In Swan Song (1947) by Edmund Crispin a discussion takes place between Professor Gervase Fen and others in the front parlour of the Eagle and Child. There goes C. S. Lewis", said Fen suddenly. "It must be Tuesday. In the TV programme "Lewis", there is an episode called "Allegory of Love" in which a reborn version of the Inklings features. The Inklings also reappear in Lewis "Magnus Opus" in 2016. The Late Scholar (2013) by Jill Paton Walsh is a sequel, set in 1951, to the Lord Peter Wimsey novels of Dorothy L. Sayers. Peter Wimsey, now 17th Duke of Denver, is investigating a mystery in the fictional St Severin's College, Oxford with his friend Charles Parker, now an assistant chief constable. Charles looked bashful. "I have heard," he said carefully, "that there is a pub in Oxford at which C. S Lewis often takes lunch." "There is indeed,", said Peter. "But he lunches with a group of cronies … Right, on with our overcoats and it's off to the Bird and Babe. ^ Kilby & Mead 1982, p. 230. ^ "Eseu - The Inklings | Bloomsbury Group | English Language Literature". Scribd. Retrieved 21 May 2017. ^ Edwards, Bruce L, CS Lewis: Apologist, philosopher, and theologian . ^ "Inklings | literary group". Encyclopedia Britannica. Retrieved 2 August 2017. ^ "War of Words over World's Worst Writer", Culture Northern Ireland, archived from the original on 12 March 2007 . ^ Tolkien, John Ronald Reuel (2006), The Letters of JRR Tolkien, London: Harper Collins, p. 388 letter #298, ISBN 978-0-261-10265-1 . ^ "Eagle & Child pub", Headington, UK, archived from the original on 5 March 2016 . ^ "Who Were the Inklings? | Looking for the King: An Inklings Novel - Available from Ignatius Press". www.ignatius.com. Retrieved 2 August 2017. ^ Inklings (literary and art magazine), Miami University . Knight, Gareth (October 2010), The Magical World of the Inklings, Barfield, Owen, foreword (new & expanded ed. ), Skylight, ISBN 978-1-908011-01-5 . Journal of Inklings Studies, Oxford , peer-reviewed & academic. Further Up and Further In , a CS Lewis and Inklings resource blog. An Inklings bibliography, The Mythopoeic Society . Inklings gesellschaft [Inklings Society] (in German), DE . Marion E. Wade Center (research collection), Wheaton . "Inklings", The Oxford Dictionary of National Biography (entry) .